The EHF and its exclusive media and marketing partner for EHF EURO events, Infront Sports & Media, have released the viewing figures for the Women’s EHF EURO 2016, which was played across Sweden from 4 to 18 December (official website). Combined with the figures for the Men’s EHF EURO played in January in Poland, a cumulative audience of more than 2.2 billion people followed more than 4,930 hours of programming at both events in 2016 – by far the highest numbers reached at any EHF EURO events since the competition format was first introduced in 1994. The Women’s EHF EURO 2016 was distributed across 135 countries by 65 broadcasters, reaching a cumulative audience of 643 million on TV, the second highest total for the competition. A total of 1,972 hours of programming were broadcast from Sweden, the highest number of hours yet from a women’s event. In key markets including Norway and Denmark, the figures were particularly strong with the finals reaching a market share of over 73 per cent on TV3 Norge thanks to the success of the Norwegian team, which claimed its seventh EHF EURO title. Denmark’s TV2 also attracted a market share of up to 52 per cent during the tournament. Ongoing investments from both the EHF and Infront in the production of engaging content across all of its digital channels is paying dividends. 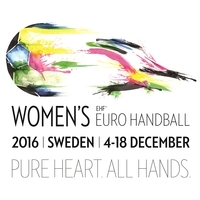 The official website www.ehf-euro.com was, for the first time at a women’s event, available in two languages (both English and Swedish), resulting in an increase in the number of users by over 71 per cent and a growth in the number of visits by over 60 per cent. Video streaming on ehfTV.com was also hugely popular with more than one million matches watched live, more than double the number at the Women’s EHF EURO in 2014. The EHF’s innovative approach to its social media coverage was further demonstrated with a dedicated Snapchat reporter added to the EHF’s media team, contributing a new level of personality, creativity and originality. On YouTube 2.2 million minutes of viewing was achieved both during and in the build-up to the event, with clips and near-live content produced by Infront on- and offsite. Coverage included the production of 360 degree content for the first time. Following the introduction of goal-line technology, goal-light signal and instant replay technology by the EHF at its major club events, the Women’s EHF EURO 2016 was the first EHF national team event to make use of the various technological developments. Instant replay was particularly well-received, offering referees the possibility to watch critical situations on a TV screen before reaching a final decision. The huge popularity of women’s handball across Scandinavia meant that Infront was able to secure a strong line-up of official sponsors for the event. A total of seven international brands benefited from extensive TV visibility through advertising sequences on LED boards, floor stickers, static boards and interview backdrops, as well as full activation rights, corporate hospitality and tickets. Partners and sponsors were also offered activation opportunities to engage directly with fans on-site through initiatives such as the ‘Friends Zone’, a dedicated fan area located next to the Scandinavium, the Gothenburg venue. More than 26,000 handball fans visited the zone, taking part in promotional activities as they passed through on their way to the venue. Preparations are already underway for the next editions of the Men’s and Women’s EHF EUROs in 2018. Croatia will host the men’s event for the second time from 12 to 28 January 2018 (official website). France will stage the women’s event and the first EHF EURO in its history from 30 November to 16 December 2018. Hosts for 2020 are also known with Sweden, Austria and Norway to host the men’s championship in January – the first to be organised with 24 teams and in three countries – and Norway and Denmark hosting the women’s tournament in December.